A double fronted Grade II listed Georgian town house of character in the heart of Ludlow's historic town centre. 40 Old Street is a splendid three story Georgian property located within a short walk of Ludlow town centre. 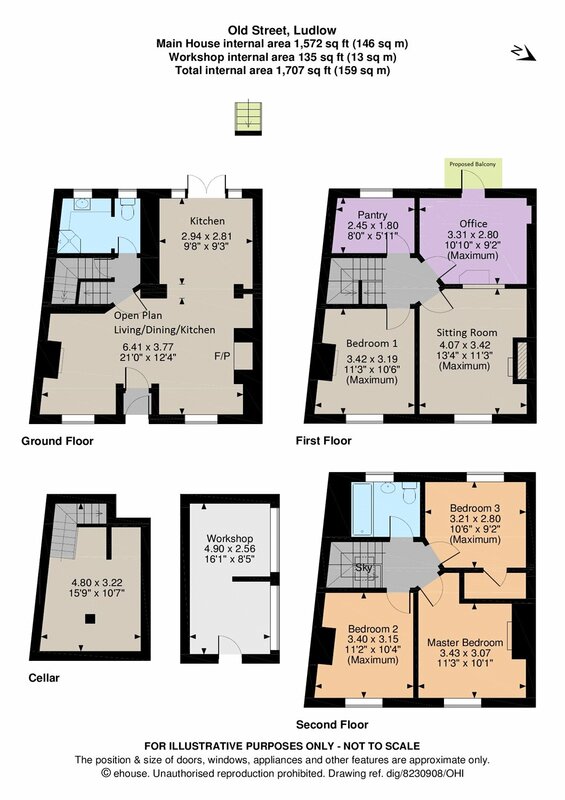 The property is entered from Old Street into the entrance porch which opens into the open plan living room/dining/kitchen. This welcoming L-Shaped, open plan room provides excellent reception space and retains several original features. With two fireplaces, one of which is currently used by our clients, this room has both exposed wooden floors in one part and tiles flooring in the other which lead through the rear of the property. From here are double doors which lead out into the courtyard garden. Adjacent to the large brick fireplace is an impressive J. Cartwright & Sons safe which is in full working order and is a feature of the property which we understand was formerly occupied by jewellers. The newly fitted kitchen is custom made of ample modern oak wall and base units with Corian worktops. There are new appliances which include an integral oven, a gas five plate hob, extractor hood above, a dishwasher and an American style fridge freezer. In the central hall is a W.C. and shower room which doubles as a utility room and access to the useful cellar. Characterful wooden stairs lead to the first floor landing. A glazed door leads out onto the first floor balcony. Exposed wall timbers have been opened up to allow you to look through from the office into the sitting room, which has wooden floorboards and a feature fireplace. Adjacent is the fourth bedroom and this also has a feature fireplace. The stairs then continue to the second floor where one can find three further double bedrooms, one with a walk in wardrobe, in addition the bathroom with bath, overhead shower, WC and wash basin. Outside there is a most attractive terracotta tiled terrace with steps which lead up to an upper seating area. There is a large shed which is ideal as a workshop and which has water and electricity. Services: Mains water, electricity, drainage and gas. Part gas fired central heating. The property is located in the centre of Ludlow. Proceed down Old Street and the property will be found half way down the hill on the right hand side, after approximately 160m.